The cricket is the second largest playing gaming event on this planet. In most of the countries like India, Pakistan, Bangladesh, Australia, England, UAE, etc., this game is worshipped like religion. People play, watch and live in the excitement of this game. 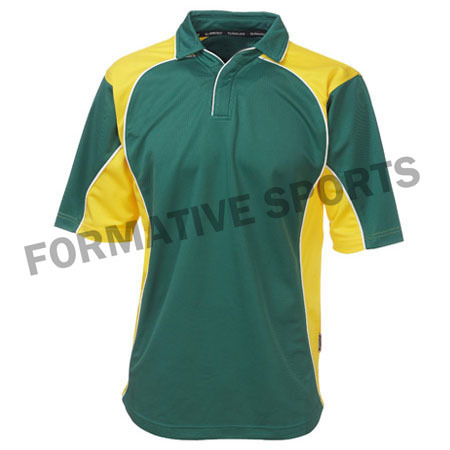 Due to huge popularity of this game, the cricket shirts are highly demanded in the market. People along with the players and cricket clubs are demanding these outfits to wear on the occasion of the game. With the evolution of the new fashion trends, the designing of the sportswear has also changed. Nowadays, to cater to the demands of the market, the cricket uniforms manufacturers are offering their range in comprehensive range of designs and shades. They are crafting collections in appealing motifs in order to give a whole new look to the team. Nowadays, the customized cricket jerseys are widely demanded in the market. These are specially created collections and are made on demand. It is the desire of every team to look great during the game. For this, all they need is the collection which perfectly manifests attributes like team name, logo, player name, etc. The designers believe in serving the interest of the clients. They develop collections which are powered with these attributes. The best available option is to buy directly from the custom cricket team shorts Suppliers. From them, you can easily get the best quality collections at most competitive rates.